LOVES PARK, Ill. – Last week, the Rockford Rivets had their first three former players drafted into the Major Leagues. This week, two former Rivets signed professional contracts for the first time. Drake Robison and Ricardo Ramirez, who both played in the Rivets’ inaugural season last year, signed contracts with Frontier League teams this week and are the first former Rivets to sign on with a professional club. Robison, a Harlem High School alumnus, played college ball at the University of Iowa and signed with the Windy City Thunderbolts. Last year with the Rivets, Robison led the team in wins with seven and had a 4.48 ERA in 13 appearances. In his senior year at Iowa, he was 4-2 with a 6.10 ERA in 20 games. Ramirez is a recent graduate of the University of Illinois-Chicago and was the primary first baseman for the Rivets last summer. As a Senior at UIC, he started in 56 games and hit .281 with nine home runs and 40 RBI. 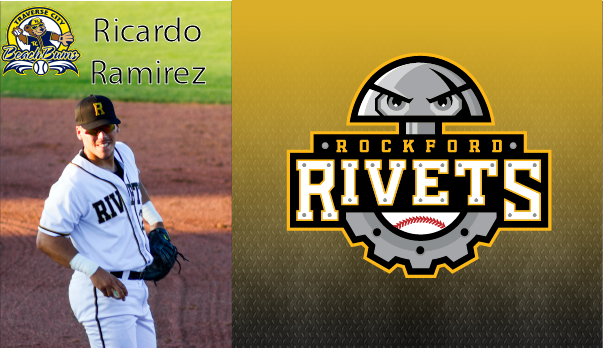 Last summer, Ramirez was fourth on the team in batting with a .251 average and added 33 RBI for the Rivets. The Rockford Rivets are a member of the finest developmental league for elite college baseball players, the Northwoods League, which will play its 24th season of summer collegiate baseball in 2017. The Northwoods League is the largest organized baseball league in the world with 20 teams, drawing significantly more fans, in a friendly ballpark experience, than any league of its kind. A valuable training ground for coaches, umpires and front office staff, 170 Northwoods League players have advanced to Major League Baseball, including two-time Cy Young Award winner Max Scherzer (Washington Nationals), two-time World Champion Ben Zobrist (Chicago Cubs) and MLB All-Stars Chris Sale (Boston Red Sox), Jordan Zimmermann (Detroit Tigers), Curtis Granderson (New York Mets) and Lucas Duda (Mets). All league games are viewable live via the Northwoods League Website, NorthwoodsLeague.com.